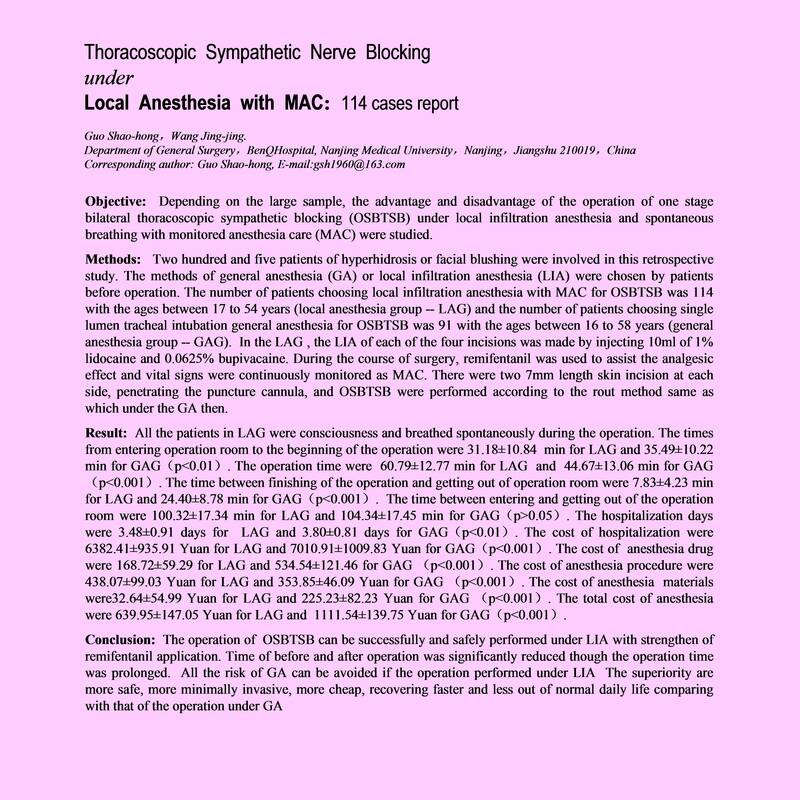 ?Abstract?Objective: Depending on the large sample, the advantage and disadvantage of the operation of one stage bilateral thoracoscopic sympathetic blocking (OSBTSB) under local infiltration anesthesia and spontaneous breathing with monitored anesthesia care (MAC) were studied. Methods: Two hundred and five patients of hyperhidrosis or facial blushing were involved in this retrospective study. The methods of general anesthesia (GA) or local infiltration anesthesia (LIA) were chosen by patients before operation. The number of patients choosing local infiltration anesthesia with MAC for OSBTSB was 114 with the ages between 17 to 54 years (local anesthesia group — LAG) and the number of patients choosing single lumen tracheal intubation general anesthesia for OSBTSB was 91 with the ages between 16 to 58 years (general anesthesia group — GAG). In the LAG , the LIA of each of the four incisions was made by injecting 10ml of 1% lidocaine and 0.0625% bupivacaine. During the course of surgery, remifentanil was used to assist the analgesic effect and vital signs were continuously monitored as MAC. There were two 7mm length skin incision at each side, penetrating the puncture cannula, and OSBTSB were performed according to the rout method same as which under the GA then. Result: All the patients in LAG were consciousness and breathed spontaneously during the operation. The times from entering operation room to the beginning of the operation were 31.18±10.84 min for LAG and 35.49±10.22 min for GAG(p<0.01). The operation time were 60.79±12.77 min for LAG and 44.67±13.06 min for GAG(p<0.001). The time between finishing of the operation and getting out of operation room were 7.83±4.23 min for LAG and 24.40±8.78 min for GAG(p<0.001). The time between entering and getting out of the operation room were 100.32±17.34 min for LAG and 104.34±17.45 min for GAG(p>0.05). The hospitalization days were 3.48±0.91 days for LAG and 3.80±0.81 days for GAG(p<0.01).. The cost of anesthesia drug were 168.72±59.29 for LAG and 534.54±121.46 for GAG (p<0.001). The total cost of anesthesia were 639.95±147.05 Yuan for LAG and 1111.54±139.75 Yuan for GAG(p<0.001). Conclusion: The operation of OSBTSB can be successfully and safely performed under LIA with strengthen of remifentanil application. Time of before and after operation was significantly reduced though the operation time was prolonged. All the risk of GA can be avoided if the operation performed under LIA The superiority are more safe, more minimally invasive, more cheap, recovering faster and less out of normal daily life comparing with that of the operation under GA.